Needless to say, I was SO pumped to read this collaboration by Becky Albertalli and Adam Silvera, who are two of my favourite authors in YA. It turned out that this was such a fun and adorable read- I inhaled the book in just a few days. I am excited to share this spoiler-free review with you guys! Maybe nothing. After all, they get separated. Maybe everything. After all, they get reunited. But what if they can’t quite nail a first date . . . or a second first date . . . or a third? What if Arthur tries too hard to make it work . . . and Ben doesn’t try hard enough? What if life really isn’t like a Broadway play? I loved Ben and Arthur and wanted so much for their relationship to succeed. Arthur was a summer intern at his Mom’s law firm in New York. He had great marks and was aiming for Yale University. He never had a relationship before, and he was a firm believer in love at first sight. When he met Ben at a post office, he was certain that he wanted to get to know Ben better, though he didn’t get Ben’s number. Ben just got out of a relationship with his ex-boyfriend, Hudson, and was going to spend the summer in summer school to catch up on a failed class. Unlike the bright-eyed and eager Arthur, Ben had a jaded and skeptical view of relationships. Because of his past failed relationship, Ben was convinced that all good things came to an end eventually. Unlike Arthur who gave everything his 100%, Ben would rather not try hard at all. Other than the MCs, we also have a great cast of secondary characters, from Ben’s flirtatious best friend Dylan, to Arthur’s friends from Georgia. I loved that these friend circles had their own history and their own dynamics, though we were only seeing the tip of the iceberg in this novel. I also loved how Ben and Arthur’s families were portrayed- They were loving and caring, though not without their problems. In What If It’s Us, Ben and Arthur’s relationship got off to a stumbling start as they learned more about each other. The plot was somewhat predictable, although the characters and the writing had me hooked and kept me turning the pages. I appreciated the events in this novel were realistic, and though it was sweet and cute, it was not over-the-top. I also enjoyed the subplots in this novel. Although the story mainly focused on Ben and Arthur’s relationship, we were also able to see developments in Ben and Arthur’s friendships as well. I loved that their relationship didn’t exist in a silo but that they were surrounded by a network of friends and family. This novel was a collaboration between two authors, Becky Albertalli writing Arthur’s POV and Adam Silvera writing Ben’s POV. While Ben and Arthur each had a distinct voice, I thought that their writing styles complemented each others’ well. I loved that the writing style was engaging, funny and easy to read. The dialogues flowed naturally. The Bottom Line: 4/5 stars! 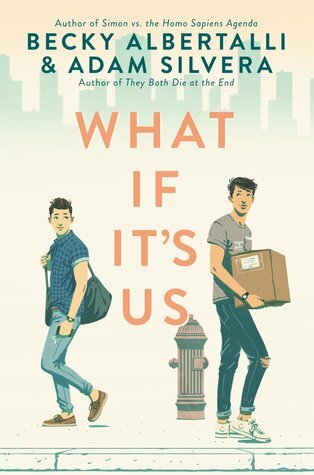 Overall, I enjoyed reading What If It’s Us. It was a sweet, adorable, and addictive YA romance with lovable characters and great character chemistry. Do you have a favourite YA contemporary book? Have you read this collaboration by Becky Albertalli and Adam Silvera? If so, what are your thoughts? I’m really glad you enjoyed this book Sophie. Becky Albertalli and Adam Silvera are two of my favourite YA contemporary authors so I was so excited for this release too. I agree I think their individual writing worked well together (hopefully that means we’ll see more collaborations from the two of them). Aside from Arthur and Ben’s relationships development I also loved the focuses on their families and friendships too. I feel like developing the side characters and their relationships with the main characters are Albertalli’s and Silvera’s strengths, so it was great to read that in this book as well. I would love to see more collaborations from Becky Albertalli and Adam Silvera!!! Seems like this was a successful one and they seem to like each other very much, so hopefully this means there is more to come!? I love the focus on families and relationships as well. I haven’t read as many books by Adam Silvera, but in general I love that Becky Albertalli is amazing when it comes to writing family and friendship dynamics. It’s not all about the romance after all! In reality there is so much else going on! Oh have you read They Both Die at the End? That’s my favourite by Silvera so if you haven’t read that one you need to ASAP. Definitely standard for Silvera. His books have all emotionally destroyed me! Yes I loved watching Ben and Arthur’s relationship unfold, and all throughout the book I was rooting for their relationship to succeed! At first I wasn’t too sure about how the two authors’ style would fit together, since they are so different! However it worked out well, and I think it is very appropriate that Becky Albertalli wrote Arthur’s POV and Adam Silvera wrote Ben’s POV 🙂 At the same time, the writing styles in the two POVs are similar enough that if I hadn’t known better, I wouldn’t know that it was a collaboration by two authors! I was so nervous about this book because I’m not a huge Silvera fan and I haven’t liked Becky Albertalli’s non-Simon books that much, but I LOVED this one. I totally agree with you that it had a really great cast of secondary characters, and for me they really made the book. I also loved both Ben and Arthur, but all the characters were strong in this book. Great review! Glad to hear that you liked this book so much! 😀 I agree that the characters and their history and relationships were so well fleshed out. And Ben and Arthur’s relationship was so sweet! The writing style with both authors flowed so smoothly too. It’s truly a wonderful and cute contemporary! Hello Margaret 🙂 Yes I loved reading about Ben and Arthur and watching their relationship develop. This and the smooth writing style really kept me reading 🙂 Glad that you enjoyed this book as well!